Lamb shanks with leeks are quite simple to prepare and make a very good dinner recipe. They can be prepared and left in the oven to cook so that the meat falls from the bone and melts in the mouth as it is eaten. They make a good dinner party recipe and are almost hassle free in preparation. 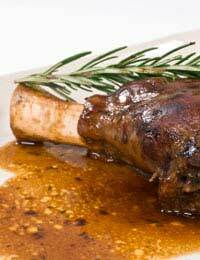 Lamb shanks are the bottom part of a leg of lamb and you should try to serve one for each guest or member of your family. This recipe is for two people. If you require the recipe to be for more people remember that you will need quite a large casserole dish as the lamb shanks are large and take up room in the dish. Ideally a solid iron casserole dish with lid would be ideal when cooking this or any other lamb recipe. An attractive casserole could also go straight to the table as long as you have a solid trivet for it to stand on. This lamb recipe is quite straight forward but there is no reason why you cannot ring the changes by adding different vegetables or even some tasty and fragrant spices and lentils to make it more European. Heat the oil in a large frying pan and brown lamb shanks. Add the onions, carrots and leeks and cook over a medium heat until the onions and leeks have softened. Add the crushed garlic and the crumbled lamb stock cube. Next add about one cup of water and simmer until the stock cube has dissolved. Season to taste. Place the lamb shanks, onions, leeks, carrots and stock into a suitable casserole dish and check that there is enough liquid to cover the meat on the lamb shanks. Cover with a lid. Place the prepared casserole into the middle of the pre heated oven for one and a half hours. Add the mushrooms, peas and gravy granules and return to the oven for fifteen minutes. Serve with either fluffy mashed potato or baby new potatoes for a satisfying easy to cook dinner. With recipes like this it is easy to supply your family with their five vegetables for the day with just their dinner leaving plenty of other meals to top up with more fruit and vegetables. If you enjoy lamb look for more lamb recipes that are easy to cook and simple to prepare. Many can be put into a slow cooker or frozen for future meals when you are in a hurry. If the meals are placed into plastic containers there is no reason that they cannot be reheated in a microwave. Take care when reheating food with a fat content as it may spit and will be very hot when handled.